It took the attack on Pearl Harbor in 1941 for the U.S. to join England and the other allies in World War II. It took the assassination of President James Garfield in 1881 and the assassination plot on Grover Cleveland in 1894 for the Secret Service to beef up its presidential protection force. And it took a tragedy in little Donora, Pennsylvania, for the nation to legislate for clean air. Donora, a riverside mill town in southwest Pennsylvania, suffered a prolonged bout of concentrated, toxic smog in late October 1948, during which at least 20 people died and thousands more became ill. The word smog had been coined in 1905 to describe London’s frequent “black fog,” but it didn’t come into use with any frequency until the Donora event. By the time the first clean air bill was passed in 1955 smog had become part of the common lexicon. That first bill, the Air Pollution Control Act of 1955, kicked things off with funding for Government-led research into the causes of air pollution. The bill didn’t address preventing pollution, just finding out more about it. Even so, the bill, signed by President Dwight Eisenhower on July 14, 1955, came about as a direct result of the Donora event, as well as a similar event in London — the Big Smoke of 1952, which had led to the death of more than 4,000 Londoners. The 1955 act was amended in 1960 to extend funding and again in 1962 to require the U.S. Surgeon General to investigate the health effects of motor vehicle exhaust. In early July 1963 Congressman Kenneth Roberts (D, Ala.) proposed H.R. 6518, the Clean Air Act of 1963, the first piece of legislation to attack prevention at the source. The resolution was signed into law by President Lyndon Johnson on December 17, 1963, not quite a month after he was sworn in as President on the tarmac of Love Field in Dallas. The bill we know today as the Clean Air Act 1970 was signed into law by President Richard Nixon, who laid out a 37-point environmental plan during his 1970 State of the Union address. Later that year Nixon created the Environmental Protection Agency, a single agency made up of sections of several different departments, including the Department of Health, Education and Welfare; National Air Pollution Control Administration; Water Quality Administration; and even the Food and Drug Administration, which gave control over tolerance levels of pesticides to the new agency. 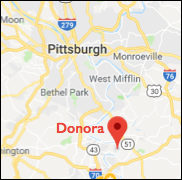 As a result of all the work done in the latter half of the 20th century the air we breathe today is infinitely cleaner than the air that sickened Donora. And that work came about chiefly due to the sacrifice made by the 27 men and women who perished that dark weekend in October so many years ago. The first clean air czar was the impressive former Assistant Attorney General William Ruckelshaus, who later famously joined his boss, Attorney General Elliott Richardson, in resigning his position rather than fire Special Prosecutor Archibald Cox in what came to be known as the “Saturday Night Massacre” of 1973.